Several miles northeast of Jersey Shore, along the mouth of Larrys Creek, lies the borough of Salladasburg. It was founded by Capt. Jacob Sallade in 1837 when he laid lots in the town and built a Lutheran and Presbyterian church. Sallade also built the first gristmill for the town. A tannery, owned by Robert McCullough, was the leading industry in the early years of Salladasburg. It was incorporated as a borough in 1884. Armstrong is the only township in Lycoming County that has had two boroughs carved from it. DuBoistown was the first of the two boroughs established. Located at the mouth of Mosquito Creek, it is a on tract of land once owned by Samuel Boone, brother of Hawkins Boone, a martyred Indian fighter and cousin of the famous Daniel Boone. Andrew Culbertson owned 172 acres adjoining Boone’s property, and established a gristmill, sawmill and a home for his family within the boundaries of present-day DuBoistown. A small town started to develop. In 1856, John DuBois purchased land within the boundaries of the area and laid out a town that he christened “DuBoistown.” Thirty years later, he founded another town, this time in Clearfield County, which he just called “DuBois.” DuBoistown was incorporated as a borough Oct. 14, 1878, despite opposition from residents of Armstrong Township. C.C. Brown was chosen the first burgess, or mayor, of DuBoistown, but he moved shortly after his selection. George Foulkrod assumed the duties. Jacob Weise bought 40 acres within the boundaries of South Williamsport and laid it out in town lots. That is what really started South Williamsport on the road to an organized town. 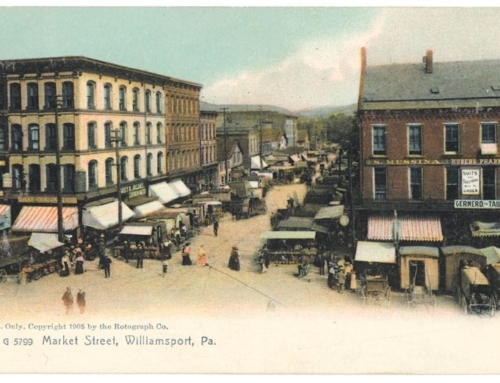 The South Williamsport Land Co. was organized, began selling lots and the building of a town commenced. Again, with some opposition from citizens from Armstrong Township, South Williamsport was incorporated as a borough Nov. 29, 1886. According to John F. Meginness’ “History of Lycoming County,” the first white man to settle in the area that became Hughesville was David Aspen in 1777. He fled the next year during the “Great Runaway.” The land on which present-day Hughesville is located, was sold to John Heap on May 7, 1793. He then sold the land to Samuel Harrold, who conveyed it to his son John. Jeptha Hughes bought the land from Harrold on March 23, 1816. Hughes then laid out a town and named it “Hughesburg,” but it was later changed to “Hughesville.” In July 1820, Hughes sold the entire plot of land to Daniel Harrold. Paul Willey opened the first tavern in 1820. The first post office was established in 1827. Hughesville was incorporated as a borough on April 23, 1852. About 2 1/2 miles north of Hughesville lies the borough of Picture Rocks. Nearby, a ledge of rocks rose from the bank of the Big Muncy Creek to a height of more than 200 feet. The first settlers found a number of Indian pictures painted on the rocks. The pictures have long since disappeared. No one ever knew what the Indian hieroglyphics meant. Legend has it that the flat area that the borough now sits was once a favorite camping spot for the Monsey Indians. A.R. Sprout and Amos Burrows founded the town in the fall of 1848. Some of their descendants still live in the town. The first post office was established in Picture Rocks in 1861, and the borough was incorporated on September 27, 1875. One story illustrates the determined character of the early residents of Picture Rocks. Early churchgoers of Picture Rocks met in an old, dilapidated schoolhouse. A circuit preacher once remarked to one of the members of the church that he “dreaded attempting to preach in that pig pen of a house with such low ceilings and the broken walls.” So the people of Picture Rocks acquired a lot. Through their combined labor and material, the erected a sturdy church in just eight days. The church served the people well for more than 25 years. According to historian Meginness, “There is much bold and beautiful scenery in easy view of Montgomery.” This continues to be one of Montgomery’s major assets. Cornelius Low was probably the first settler in 1778 in the area that became Montgomery. John Lawson and Nicholas Shaffer soon followed him. A town grew slowly and a post office Ð called “Black Hole” with Samuel Ranck as its first postmaster Ð was established March 26, 1836. In 1853 “Black Hole” became “Clinton Mills” and in 1860 it became “Montgomery Station.” The borough of Montgomery was built on land taken from Clinton Township. Montgomery was erected as a borough on March 27, 1887. The Indians were eventually driven from the area and settled in the area around Muncie, Indiana. The town grew slowly and was just a sleepy little village that had the nickname of “Hardscrable.” The first post office was established in April 1801. Pennsborough was incorporated as a borough on March 15, 1826. On January 19, 1827, the name of Pennsborough was changed to Muncy because many people thought that the previous name was “too flat and too long,” and the new name would be more in keeping with the historical nature of the place and also would help to perpetuate the name of the Indians who used to reside in the area.